As 2014 comes to a close, we’re talking #RealSchoolFood recipes that you might want to incorporate in 2015. The overall goal is to offer you some great scratch recipes, saving you the time, money and hassle to creating your own recipes from scratch. Remember the recorded USDA webinar on Finding and Creating School Recipes for Success with USDA Foods (featuring Malissa Marsden and me) is available on YouTube. Several colleagues have suggested that this would make a great (and free) January in-service to share with your staff. Another wonderful source of recipes is your friends and colleagues in the school food world. Most school nutrition professionals are more than willing to share recipes – just ask nicely and be sure to say thank you! Here are three examples of recipe sources from colleagues you can trust. 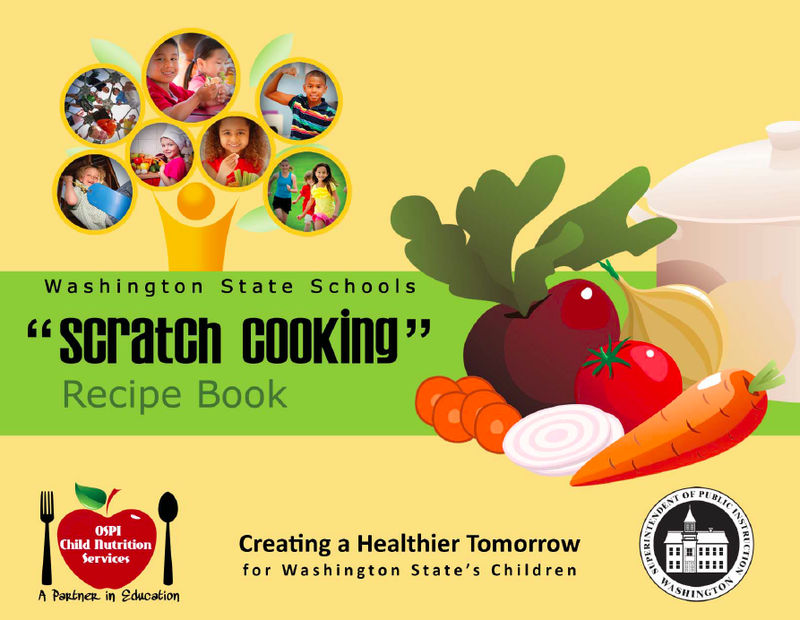 The Washington State Schools “Scratch Cooking” Recipe Book is packed with delicious contributions from school cooks across Washington. More than 20 districts contributed recipes to this September 2013 publication (all recipes meet new meal pattern guidelines). The book has lots of interesting main dishes, from basic Chicken Fajitas to Italian Baked Fish w/ Provencal Sauce, as well as grains, fruits and vegetables. 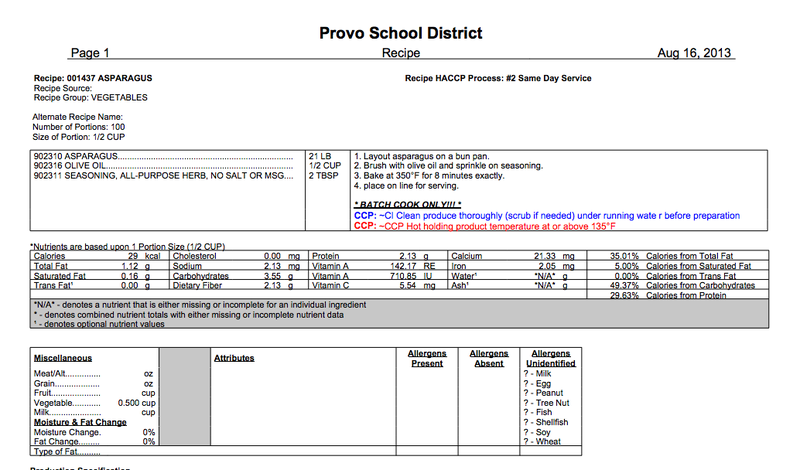 Provo School District in Provo, Utah, is an outstanding example of scratch cooking with locally sourced ingredients. They are also incredibly generous with sharing their food art on Facebook – and their recipes as well. In May 2014, they shared six recipes that featured local meat, poultry, veggies, fruits and even mushrooms! You can download them at Provo City School District Recipes with Local Food Items from the National Farm to School Network database (where you can also search for other recipes and resources). I can personally recommend the Roasted Asparagus, which I once had the pleasure of both eating and serving this recipe to middle school students. Many of them asked how many spears they could have! 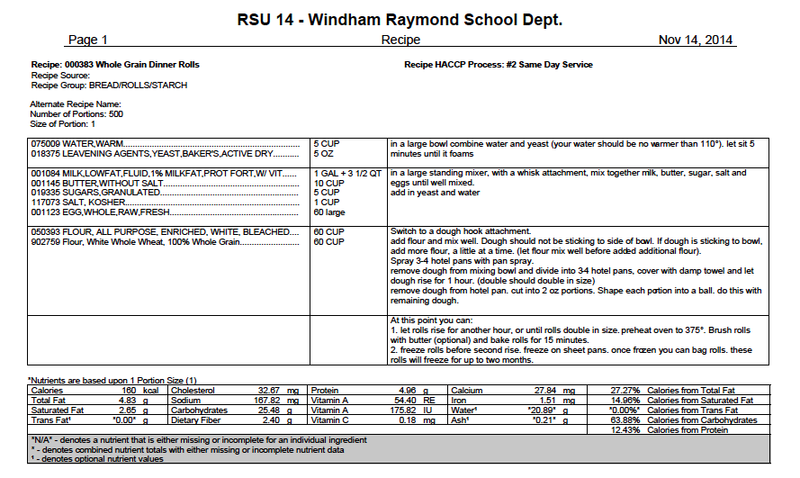 As a final treat, Windham Raymond School Nutrition Program, RSU #14 in Maine, has been kind enough to share their recipe for the Whole Grain Rolls served at their Thanksgiving meal in November. Here is what Director Jeanne Reilly wrote to go with these yummy photos: “Yesterday was such a great day, with so many of our students and staff taking part in our Thanksgiving Feast throughout our entire district. Our “homemade” school baked rolls were a huge hit and many have requested the recipe. 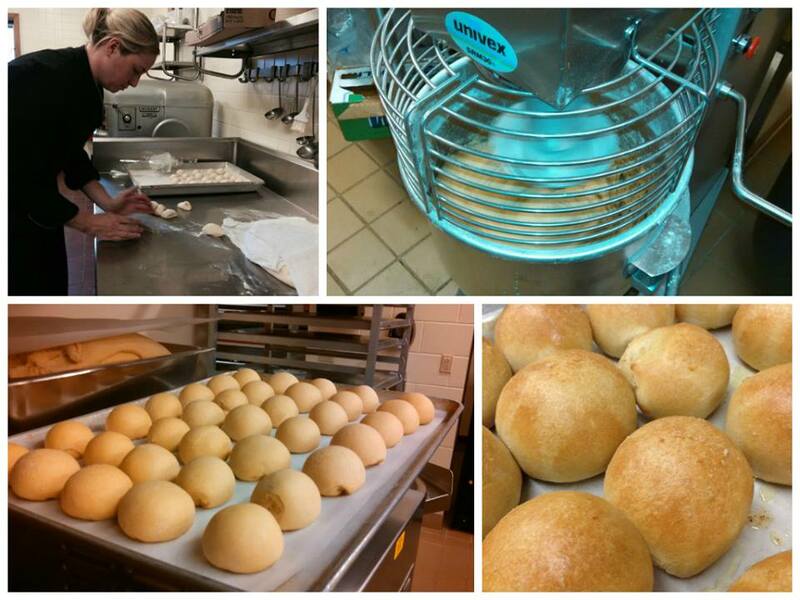 Our rolls (unlike the original recipe) were whole grain and we substituted a portion of the white flour with100% whole grain white flour.” That is district Chef Samantha forming the rolls in the top left. Here is a JPG of the recipe that Jeanne shared with me. If you cannot read it well enough in this format, send an email to SchoolMealsThatRock@gmail.com, I will send the recipe PDF to you. Thanks to Jeanne and all the other directors for being willing the share the goodness of from their kitchens!